A weevil is a type of beetle with over 60,000 species in the family. A weevil has 6 legs, averages 2 – 80mm in length and can be found in a wide variety of colors. The more common weevils, which infest residential homes, are dark reddish brown to black and their bodies often resemble either a pear or light bulb figure. Weevils have a very unique narrow head and their mouthparts are at the end of a long snout. Weevils are not native to North America and are believed to have traveled here from the seeds settlers brought to ports. Weevils can now be found on every continent except Antarctica. Weevils are most common outside homes and can enter inside seeking shelter from heavy rains. Once inside, weevils will favor kitchen pantries, cupboards and other dry storage areas. 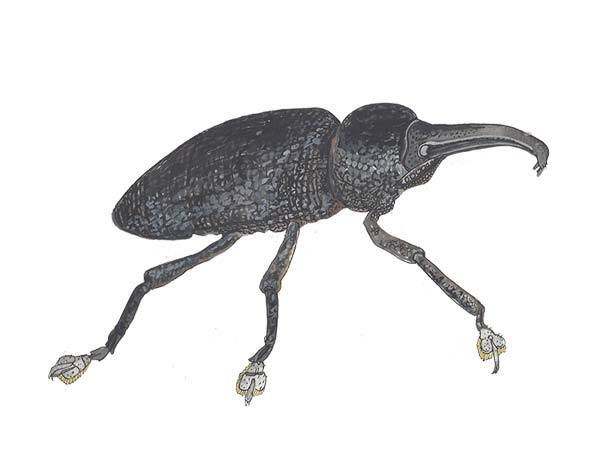 Most weevils are brought into residential homes through stored grains purchased at grocery stores or markets. Many weevils develop as larva inside the kernels of grains. Weevils are commonly found crawling inside bags of grains because females deposit their eggs in areas where larva will have access to food immediately. Some species of weevils store their eggs in the ground and others deposit them inside flowers. The hatched weevils will emerge from their cocoons in the Spring and will undergo stages of metamorphosis before reaching sexual maturity. Most weevils feed on plants, however many are damaging to crops, destroy stored grains and can wreak havoc inside kitchen pantries. Many weevils prefer stored grains such as rice, cereal, flour and pasta. Weevils are also known to thrive in outdoor home gardens and can cause extensive damage to ornamental plants. Inspect stored foods inside the home and discard infested items into tightly sealed trash bags. Take the trash out to the bin immediately. Place dry foods in zip lock bags or sealed Tupperware containers. Vacuum all floors in the house and empty the vacuum outside into tightly sealed garbage bags. Take the trash out to the bin immediately. Disinfect infected areas with household cleaners. Pest control treatments can begin after all food items have been sealed and the home has been properly cleaned. Use a residual insecticide labeled for weevils. Treat cracks, crevices, entry ways and around baseboards. We make weevil control easy and solve weevil control problems. We service Manatee county and Sarasota county for all weevil problems. Call the weevil control experts today for a free inspection. You dont have to share your food and pantry with weevils!